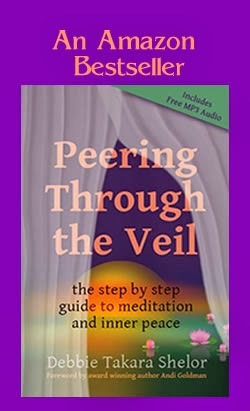 I designed the Peering Through the Veil Meditation Intensive specifically to enhance and accompany my new book, Peering Through the Veil: The Step by Step Guide to Meditation and Inner Peace. The purpose of the intensive is to go significantly deeper into meditation, healing, and stepping into your magnificence. In each weekly meditation call, I will personally guide you through the transformational world of meditation. Each week I will teach you a new aspect of meditation and answer any questions that come up as you read the book, listen to the training calls, or practice meditation on your own. Each week I will also guide you through a new and deeper meditation / activation. In case you can't make the call, they will all be recorded and available for you to download or listen to online. The meditation audios include guided meditations for healing, achieving your dreams, higher wisdom, and connecting more deeply with your true Magnificent Self. Along with my harmonically resonant voice, each meditation includes the amazing healing deep theta sounds of my dear friend, Jonathan Goldman, who so graciously agreed to include them here for you. Theta is where all the magic happens. It is where I go each day in meditation and where I suggest you spend most of your meditation time as well. These meditation audios will take you there effortlessly. The meditation journal is the perfect place to record each of your meditation experiences, along with any insights, revelations, images, or "things to do" that you receive while meditating. The roll-on Meditation was designed specifically to accompany Peering Through the Veil and to assist you in achieving and maintaining the tranquil state necessary to enjoy deep meditation. Shaman’s Dream helps you experience more vivid meditation experiences. Grounding allows you to feel less spacey and disoriented after a meditation, which can happen with certain powerful types of meditation. Violet Flame is for purification and clearing disharmonious energies, transmuting them with the Violet Flame. Return from the Healing Meditation Kit to the Peering Through the Veil meditation book by Debbie Takara Shelor home page.